I'm back on the wretched ivs again... but I did get a little more baking in before I had to temporarily hang up my oven gloves. Right now I am feeling pretty grotty and frequently nauseous, so baking is one of the last things on my list of things to do! I have been indulging in some online retail therapy recently and my amazon addiction is showing no sign of abating, and one of my purchases is the lovely Ritz London Book of Afternoon Tea. It is definitely one of those little books that are described as charming in the publicity blurb; its filled with lovely illustrations of Victorian ladies and gents taking tea and has some great little tea related poems and stories. Its also written in the style of a slightly un-PC maiden aunt who has been at the sherry a bit too much... I particularly like the fact that the recipes are divided into English cakes and Foreign and Wicked cakes! Wicked French fal-de-lals covered in cream and other such decadence! 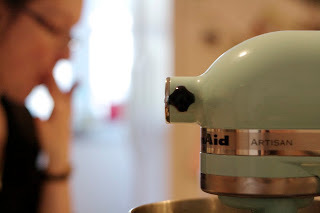 I decided to have a go at their recipe for rock cakes as I have always liked a good rock cake and they really are so simple, its a good recipe for when you are feeling tired and full of cold- as I was when I made these. One good thing I have discovered during making these, is that my kitchenaid can rub butter and flour together really brilliantly and far more quickly that I can do it by hand. It also means I don't get loads of flour and butter stuck under my fingernails which is one of my absolute pet hates-ick ick ick! So a bit of a quick mix of everything else and whack 'em in the oven for about fifteen minutes and that's it- very quick and very yummy. I finished them with a good drizzle of leftover chocolate icing- I never throw icing away, I will make extra cakes just so that I dont have to! I have a bit of a funny relationship with food. As a PWCF I have problems with digesting food, particularly with absorbing fat. This means I have to eat as much food as I can, as often as I can, to maintain a healthy weight; its what I call the CF Diet. I can't remember a time when there wasn't a dietitian/doctor/nurse/parent telling me I needed to eat more-they still do! According to the health pros I should really be consuming one and a half times the recommended number of calories for an adult female- which I find practically impossible! Added to this pwcf don't produce enough of the hormone ghrelin that makes the body feel hungry, so even tho I have to eat a lot I very rarely feel hungry. People often say to me "oh you are so lucky you can eat whatever you want and not get fat." Although I usually just smile at this remark, what I would really like to say is "b*ll*cks! Getting past the obvious fact that being thin is never going to be any sort of compensation for having CF, this is simply not true. I do not get to eat what I want, if I did I probably would not eat very much at all and would survive on tea and cake! What I have to do is eat even when I don't want to, when I am feeling nauseous or when I have awful heartburn and quite frankly this is not fun. If I don't eat enough the weight falls off me at an alarming rate and I can go from my okish BMI of 19 (the dietitian would prefer 20+, 20 being 'normal') to about 16 or even less, which is getting into dangerously low. malnourished territory. For most women this would probably be fabulous-easy weigh lose, but for me it means no energy, lungs get rapidly worse and I end up on IVs or worse. Without the high calorie intake I try and maintain, my health collapses frighteningly quickly, so I really don't have a choice as to whether I keep to my diet. 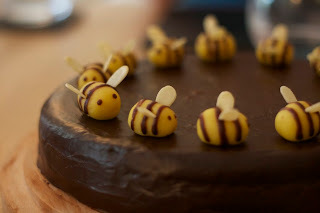 I've got a bit behind already with blogging the cakes I've been making-oops. So here is a quick post of two that I made a while back. 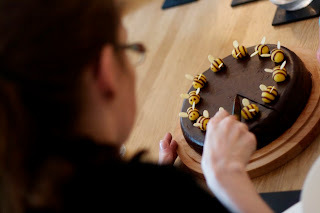 The first is a Honey Cake from Nigella's chocolate cake hall of fame in her book Feast that I made for my birthday lunch. 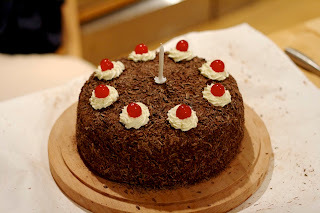 It was a little later than my birthday cos as usual I was on ivs so had to put it back a week. 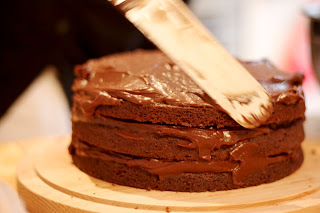 It's a really gooey, sticky, rich cake that you can only eat small slices of due to its density! Classic Nigella basically. 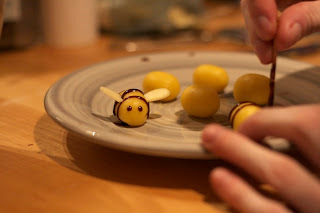 Sadly, I can't claim that I thought up the lovely marzipan bee decoration idea, but they have proved so popular that my Mum has had me bunging them on cupcakes and cakes for family birthdays ever since. 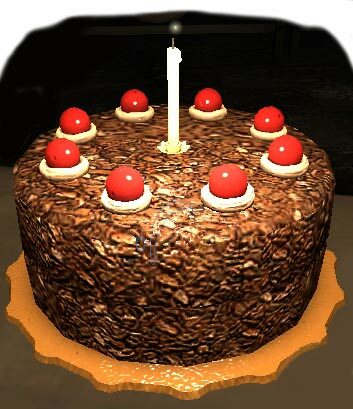 Apparently, the game's main premise is that humans will do anything to avoid death and to get cake-seems fair! But as you are trying to escape from an evil computer, sometimes the cakes you find are a trap and is actually going to you, hence the quote 'the cake is a lie!' 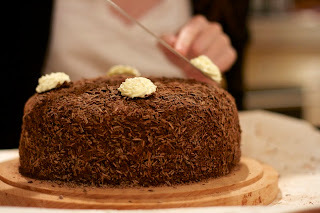 This was exclaimed many times when I took the cake to the party, but didn't stop people eating it. It looks like some sort of black forest gateau, but I'm not a huge fan of them so I made a cake called Brooklyn Blackout cake from the Hummingbird Bakery Book and covered it in chocolate custard and shredded chocolate. Three layers and LOTS of chocolate custard. The photos here are all taken by Mr EB, hence they are all much more in focus and interesting than my attempts. So just to finish off, here is a rather fun picture he took of my gorgeous Kitchenaid with me in the background.